Microsoft has announced that next major update Redstone 2 will be called ‘Creators Update’. Windows 10 Creators Update will come in March 2017. More details here. Meanwhile, the company is now testing new cumulative update for Windows 10 1607 Anniversary Update users. The upcoming update will push Windows 10 build to 14393.443. 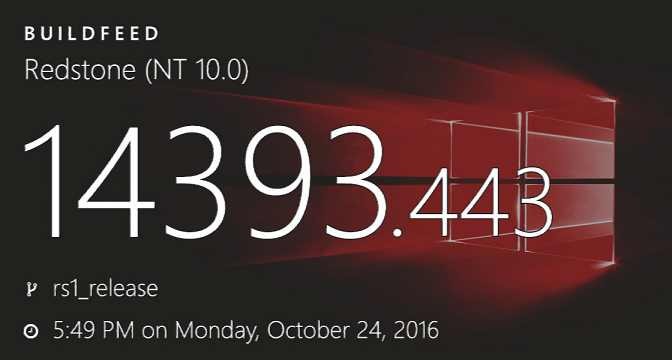 The new cumulative update build 14393.443 and mobile build 10.0.14393.443 was compiled on October 24, 2016. Windows 10 1607 build 14393.351 is now available for slow ring and release preview members. Previously, the company released cumulative update KB3194798 (Build 14393.321), KB3192441 (build 10586.633) and KB3192440 (Build 10240.17146) for Windows 10 users. Windows 10 preview build 14931 is also now available for Slow ring insiders. You can download ISO from here.